Silver has been used for the treatment of various infirmities for thousands of years. The ancient Greek physician Hippocrates first described the antimicrobial properties of silver in 400 BC. During the German Renaissance, the Swiss physician Paracelsus revolutionized trauma care when he introduced the use of silver nitrate as a wound treatment. Colloidal silver is a suspension of silver particles in a medium for internal use, such as water, or a gel for external use. The particles typically measure between 1/10 and 1/1000 of a micron in size. The smaller the silver particles, the more efficient they are at entering cells. The efficiency with which colloidal silver particles enter cells significantly influences their health benefits, including their ability to kill pathogens and boost immune function. Why Is Colloidal Silver so Controversial? There are few health supplements more divisive than colloidal silver. Today, we have two camps with very different opinions about silver – one camp touts it as a cure-all that can successfully treat everything from Lyme disease to cancer, while the other camp claims that silver has no effect at best, and at worst, will turn you blue! Is the controversy surrounding silver overblown, or is there some truth to it? The biggest risk associated with ingesting silver is a condition called argyria. In argyria, silver compounds accumulate in various parts of the body, causing the skin and mucous membranes to turn a metallic, blue-gray color. Argyria is most commonly caused by exposure to extreme quantities of silver particles or dust, such as in silver mining. While some people use the example of argyria to argue why we shouldn’t take colloidal silver, the truth is that high-quality colloidal silver does not cause this condition. Making and consuming your own DIY colloidal silver may put you at risk for argyria because such a method cannot reliably produce a safe, effective product. Silver supplements produced by well-reputed brands such as Results RNA, on the other hand, will not cause this condition. The lack of human research on colloidal silver has further added to the controversy. Most of the research on silver comes from cell culture or animal studies, not randomized, placebo-controlled trials in humans. The most likely reason why scientists have not studied the health effects of colloidal silver in humans is that silver is not patentable, and therefore, not profitable. Thus, the paucity of human research on silver may be due more to financial conflicts of interest than to a lack of efficacy on the part of silver products. While not all forms of silver or colloidal silver are safe, there are silver products out there that adhere to exceptional quality standards and are both safe and effective. Keep reading to learn about the silver I recommend, after I cover some of the fascinating health benefits. Today, scientists and healthcare practitioners are rediscovering the health benefits of colloidal silver. A growing body of research indicates that silver has potent antibacterial, antiviral, antifungal, biofilm-destroying, immune-boosting, and wound-healing properties. Fascinatingly, historical medical documents indicate that silver was the most important antimicrobial agent available before the advent of antibiotics! In the 1800s, silver nitrate was used to treat skin wounds and non-healing ulcers. Silver coins were dropped into drinking water barrels for protection against water-borne bacterial illnesses, and during the Civil War, silver was used to treat syphilis. It was only after WWII that antibiotics displaced silver as the leading antibacterial agent employed by the medical community. In recent years, silver has experienced a resurgence in popularity for the treatment of bacterial infections. Many cell culture and animal studies have demonstrated the potent antibacterial properties of silver. Colloidal silver is a broad-spectrum antibacterial agent against aerobic and anaerobic bacteria (1). It damages the cell membranes of Salmonella and Escherichia coli, reducing their viability (2). The silver ions in colloidal silver also pass into bacterial cells, where they interfere with metabolic processes and damage DNA, leading to the death of the bacteria. Silver also makes antibiotics more effective – upon entering bacterial cells, silver promotes the increased production of reactive oxygen species, which make bacteria more susceptible to antibiotics (3). The antibacterial activity of silver appears to hinge on the silver particle size; smaller silver particles demonstrate more efficient antibacterial activity than larger particles (4). The potent antibacterial properties of silver, even in the presence of antibiotic-resistant bacteria, make it a useful treatment for MARCoNS (5). MARCoNs (multiple antibiotic-resistant coagulase-negative Staphylococcus) is a bacterial infection that resides deep in the nasal passages of immunocompromised individuals who’ve been exposed to biotoxins such as Borrelia burgdorferi, the bacterium that causes Lyme disease, or toxic mold. You can learn more about MARCoNS in my podcast interview with Dr. Yoshi Rahm. 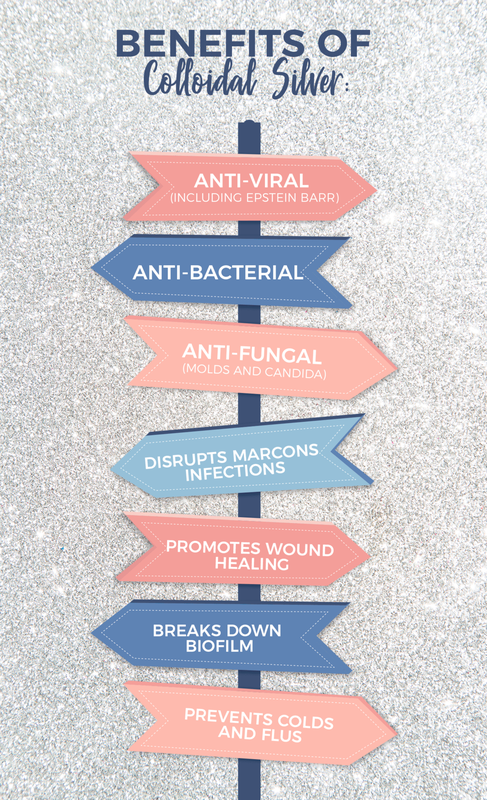 If you have MARCoNS, colloidal silver is useful because it disrupts the antibiotic-resistant Staphylococcus colony, restoring a healthy balance to your nasal microbiome. In my practice, I mix ACS silver nasal spray with Biocidin to treat MARCoNS. Multiple surfaces in the human body, including the skin, teeth, and gastrointestinal mucosa, harbor biofilms, consortiums of microorganisms embedded in an extracellular matrix and adhered to a surface. Biofilms are notoriously difficult to eradicate, and extensive efforts have been made in the scientific community to discover effective biofilm-disrupting agents. Interestingly, colloidal silver is one of the most powerful biofilm-disrupting compounds discovered to-date! Silver disrupts clinically-relevant biofilms produced by pathogenic methicillin-resistant Staphylococcus aureus (MRSA) and Pseudomonas aeruginosa (6). When applied topically, silver nasal spray also disrupts biofilm in the nasal cavity, improving symptoms of chronic sinusitis (7). By disrupting biofilm, colloidal silver may also work well as a nasal decongestant spray. Silver nanoparticles, such as those found in colloidal silver supplements, possess antiviral properties. They inhibit the replication of herpes simplex virus, hepatitis B virus, and several respiratory viruses (8). In my practice, I also use ACS nasal spray (more on that later) to keep Epstein-Barr virus in remission. If you’ve ever been exposed to a moldy living or work environment, it is likely your gut has taken a hit and may be harboring mold spores. Fortunately, silver can help! Researchers have found that silver nanoparticles, such as those included in colloidal silver formulations, inhibit the synthesis of mycotoxins by Aspergillus, a fungus frequently implicated in mold illness (9). No cytotoxic or inflammatory responses to the silver nanoparticles were observed, suggesting that silver may be a safe, effective intervention for those struggling with mold illness. Silver also inhibits the growth and formation of biofilms by Candida albicans, an opportunistic yeast that can cause gut dysbiosis (10, 11). If you suffer from frequent vaginal yeast infections or gut dysbiosis, silver may be a handy tool to add to your treatment protocol. Want to avoid getting a cold or the flu this winter? Try taking colloidal silver! Silver nanoparticles have anti-influenza activities; in fact, intranasal administration of silver has been found to lower viral titer levels and reduce lung lesions in mice infected with the influenza virus (12)! Silver also reduces the infectivity of other respiratory infection-causing viruses, such as human syncytial virus, and may, therefore, prevent colds (13). Silver nanoparticles exert antiviral effects by damaging the viral envelope, the membrane that encapsulates and protects the virus from outside influences; this reduces the virus’s viability and ability to infect others. Colloidal silver has been used for hundreds of years in the treatment of wounds. In recent years, the benefits of colloidal silver wound dressings have been rediscovered. A study published in the Journal of Wound Care found colloidal silver gel to be useful for preventing wound biofilms caused by Staphylococcus aureus, Pseudomonas aeruginosa, and MRSA (14). Silver truly has an abundance of health benefits to offer, particularly for fighting infections, boosting immunity, and detoxifying the body of bacteria, biofilms, and mycotoxins. However, I don’t recommend just going out and buying the first silver supplement you see at the grocery store or vitamin shop. Silver products vary widely in safety and potency, which is why I recommend Results RNA Advanced Cellular Silver Nasal Spray and colloidal silver hydrosol. These silver products are ultra-pure, derived from 99.99% pure silver with no contamination by toxic heavy metals. The small particle size of the silver enhances its bioavailability in the body, ensuring that you get the maximum health benefits of colloidal silver. All new customers will save 15% on our favorite silver products and a few carefully-selected items that can maximize your results. Just use promo code ‘New15’ at checkout! 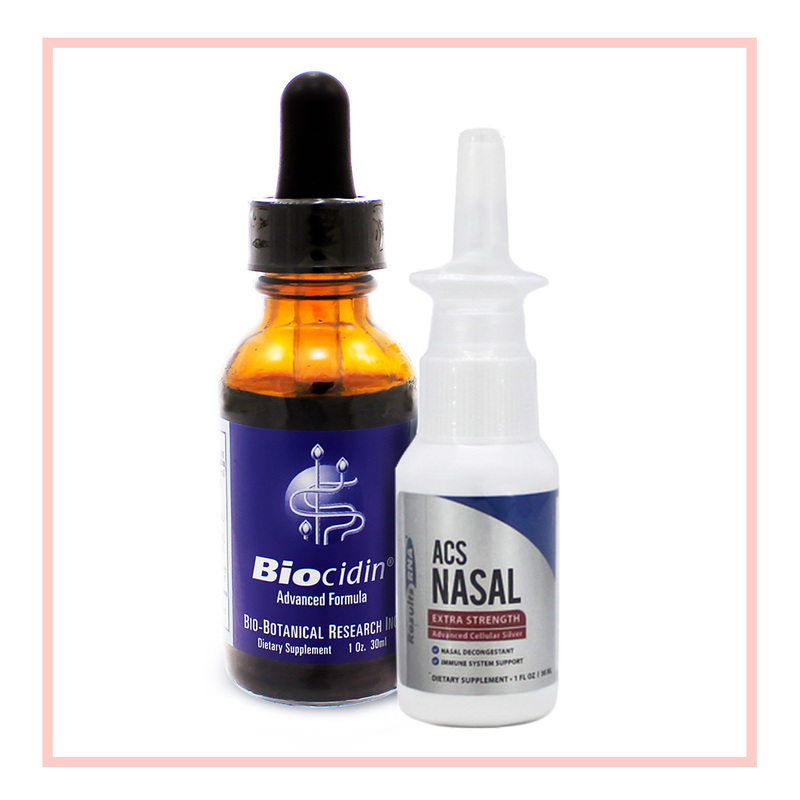 Biocidin Tincture: Visit the shop page to learn how Bridgit uses this in conjunction with the silver nasal spray to help heal her MARCoNs mold infection and Epstein Barr virus. I hope this blog has convinced you to give silver a try! Whether you want to stave off a cold or flu this winter or are recovering from mold illness or dysbiosis, silver can help significantly. If you have questions about silver or would like to share your experience with silver, please leave a comment below!